That’s the motto of the New England Collegiate Baseball League (NECBL) and it fits. Every summer college baseball’s best players trade their composite bats in for wooden ones and flock from all over the country to summer leagues like the NECBL in pursuit of the dream that is professional baseball. Summer leagues are independently run baseball leagues sprinkled throughout the country that give college baseball players a place to show off for scouts during the offseason. Some of these leagues are more exclusive than others but they generally feature top players with aspirations of someday making it to the major leagues. One of the big things that sets summer league apart from what you see during the regular college season is the type of bats that players use. In college baseball players use composite bats. These bats sit in a kind of middle ground between aluminum and wooden bats; the ball doesn’t jump off the bat quite the way it would off of an aluminum bat but it’s still more reactive than the wooden bats used in Major League Baseball (MLB). In summer leagues these wooden bats are the standard, which is one reason professional scouts make sure to come out and watch how players fair with them. Going straight from the college season — which for some stretches from February to June — into two more months of baseball can be a grueling slog; keeping one’s eye on the dream and understanding the importance of summer ball are necessities if one wants to get through the season. This importance does not mean that summer leagues are big-money affairs. Most leagues are located in smaller cities and towns like Battle Creek, Michigan, and New Bedford, Massachusetts, and though often popular with locals, don’t generate much revenue. Single-game tickets for an adult generally only run fans $5, with discounted tickets available for kids, seniors and students. These prices are great for families looking for a cheap summer night out but not so great for a team’s bottom line. Though MLB does not own summer leagues like the NECBL they do provide some funding which helps with essentials like equipment, uniforms and transportation costs — but after this there’s not a ton of money to go around. To remain standing teams depend on the communities that house them. This volunteer involvement comes in many forms. 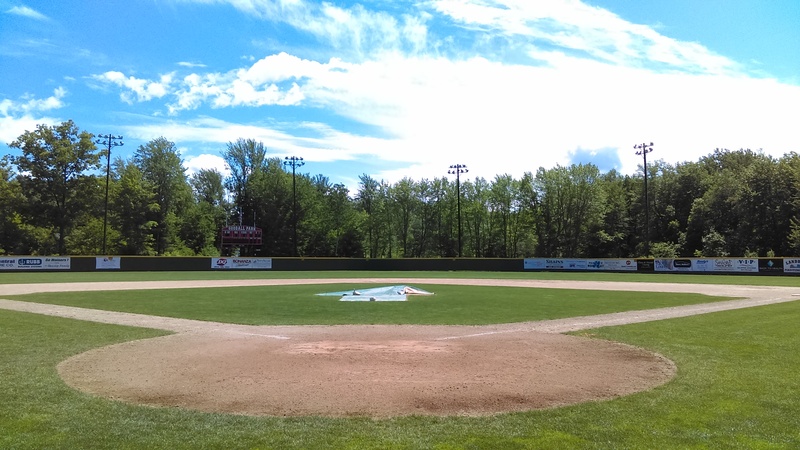 Porter spent his first two years with the NECBL calling New Bedford Bay Sox games for free; others help out with things like field maintenance and stadium operations. Though all volunteer positions play a role in the success of a team there are probably no volunteers more important than host families. Host families take players in for the summer much in the same way that a family might host a foreign exchange student over a school year, providing players with a roof over their heads and food in their bellies. Crane credits host families as one of the biggest factors in summer leagues being possible from a financial standpoint; with their support teams don’t need to shell out money for players’ lodgings and players don’t need to find ways to work around a hectic baseball schedule in order to pay rent. A look at the cost of living in a place like Hartford, Vermont, where Crane’s team is located, provides important perspective into why host families are a fiscal necessity. In this area a cheaper-end, three-bedroom apartment might go for around $1,100 a month. If Crane was able to find 10 apartments around this price willing to sublet to his 28-30 players for the two-month season, the total cost would come out to $22,000 before utilities. This would bankrupt most teams and summer leagues as they are today would not exist. Tim and Donna Desouza have been hosting players from the New Bedford Bay Sox in their home since 2013. That summer they had heard from a friend that the team was having trouble finding places to put players up. Because Tim had just retired from the Army — meaning he could spend a lot of time at home making sure things went smoothly — they decided to give it a try. These early nerves are common amongst host families which is why teams have a thorough process in place to set expectations for players and host families early. Teams make it clear that any heavy drinking or trouble caused in town will cost players their spot on the team. Failing to abide by team rules could also have repercussions for more than just the individual offender. “That would affect a school’s relationships with teams,” said Nick Friar, an alum of both the NECBL and the Cape Cod League. “Sometimes teams would request don’t send us any guys [from your school this year], or make sure this guy’s not a jerk like the last guy you sent us.” College teams cherish their relationships with summer ball clubs, so they do their part to make sure players stay in line so they don’t get phone calls like the one Friar described. Many teams, like Crane’s Nighthawks, have committees of volunteers who visit potential host families’ houses, both to answer any questions families might have and to make sure the spaces are suitable for players. As long as a family is up for the task, has a spare room, some food that the player can scrounge and a place to do laundry they’re approved. Many host families go above and beyond this. “We spoiled our players,” said Tim Desouza, who would sometimes cook meals for the entire Bay Sox pitching staff on days when the team traveled. A big part of the Desouzas’ philosophy in hosting revolves around the fact that the guys they hosted were there to play baseball, and they wanted to give them the ability to focus on that purpose as much as possible. Danny Tyson was the first player that the Desouzas ever hosted. Over his college summers Tyson got the opportunity to pitch for teams in both the NECBL and the Northwoods League located in the Midwest. In both leagues he was placed into host families who went far beyond the minimum requirements. It takes some time to get used to a stranger living in your home but most host families become very close with their players by the time the summer is over. Both Tyson and Friar had such positive experiences that they still text and talk with their families regularly; Tyson is even looped into a few group texts between the Desouzas and other players they’ve hosted after him. Tim and Donna went so far as to describe the relationship that developed between Tyson and their son J.J. as “big brother, little brother.” When families work to garner connections with players like this teams take note. His team, the Falmouth Commodores, took this advice to heart. Since then Murphy and Duggan have hosted top players like Brandon Finnegan, who went on to earn a World Series ring with the Royals and Alec Bohm, who was chosen number three overall in the 2018 MLB draft. Host families are compensated for their troubles; teams shower the families with swag packs that include things like season tickets, team merchandise and gift cards to local restaurants. There are also regular team events and potlucks to create a larger support system across host family households. Still, from a purely fiscal standpoint, this doesn’t come close to paying the families for the service they provide the team but nobody decides to become a host to turn a profit. Most families are in it because they love baseball and want to help a young athlete succeed. The Desouzas were so dedicated to this that they even hosted one of their players over the winter so he could spend time working out and practicing with the Bay Sox’s trainer. It’s families like the Desouzas that show host parents are more than just stewards of a spare room, box of cereal and washer-dryer combo. They are a support system that nurtures players for two months while they play game after game in towns they likely hadn’t heard of before the season. They make it possible for players to keep their eye on the dream.